The sun is shining as I start this newsletter but tomorrow is going to be rainy again. Spring might be off to a slow start, but it is here. 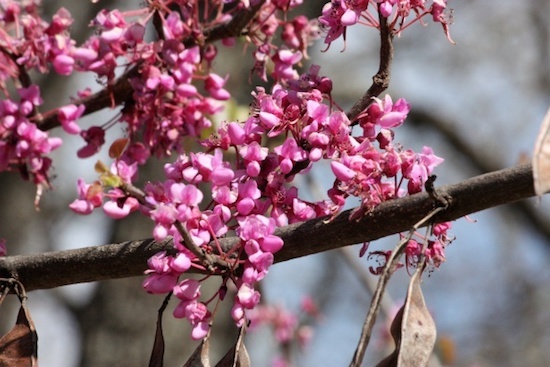 For me, nothing says spring in Lake County like our native Redbud, and they are beginning to blossom. The lilacs are budding as are the azaleas. Shoe Button Spireas are covered in tiny white blooms. Goldflame Spirea’s flaming new growth is emerging. The Deutzia should be opening any day now. 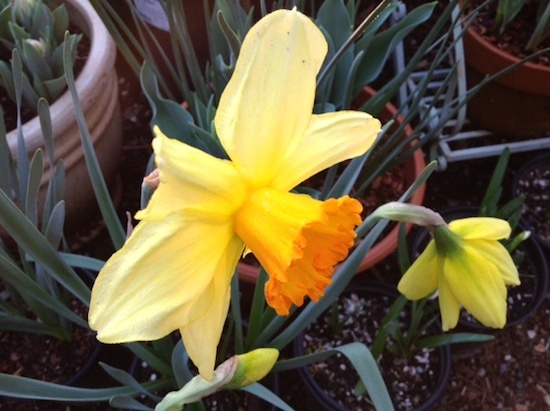 Our pots of tulips are beginning to bloom, and the daffodils are in full color now. So yes, Spring is here. To Do List: Plants put on their biggest growth spurt in spring so if you have not fertilized yet now is the time. The EB Stone Organic All Purpose is fine for everything, but we like to use the EB Stone Rose and Flower on our roses and other blooming perennials. Feed your lawn now too. April and October are the best months for over-seeding, repairing patches or starting a lawn with seed. A lot of things can be planted this month like summer blooming bulbs and perennials, but frost tender plants like tomatoes and marigolds will need to be monitored. Things could change, but right now I think it is too early with the weather this year to be thinking too seriously about summer veggies although we do have a few starts in already. Hopefully, this will change by mid-month. For me, on the valley floor, it is traditionally not safe to plant tomatoes till the end of the month. Remember that soil temperature is more important than air temperature to get your summer vegetables to grow. They simply will not root out if their feet are too cold and it will end up stunting them. Pest Problems: It has been a wet spring, and you might have to spray your peaches and nectarines one more time as the flowers fall off to keep Peach Leaf Curl fungus under control. Check your roses for Downy Mildew. This is an internal disease that can damage or kill a rose, usually starting with the inner growth. I suspect I might have it if I see distorted growth with orange tints to it. Copper can be effective but sometimes you have to get more serious and use the Agri-Fos we carry. Remember to always spray early or late in the day to avoid damaging or killing pollinators. We now have Peach Borer traps to accompany our Coddling Moth traps for Apples and Pears, and we discovered Cucumber Beetle traps that we have on order. I have already placed the Peach ones in my trees. We are getting beneficial nematodes in this week, and I plan on putting them around my fruit trees. These attack the bad grubs in the ground before they emerge to bore into my trees. These need to be used quickly, so I am hoping people reading this will buy me out while they are still viable. We should also be getting Lady Beetles in any day as aphids will soon be hatching. Another pest are weeds. We are carrying the 30% Industrial Strength Vinegar. This needs to be handled carefully with gloves, and eye protection recommended and is very effective using it straight without any dilution. A more economical way to use it is to dilute to 15-20% acetic acid, add a little dish soap and spray directly on the weeds on a warm sunny day. The acid is what kills the weeds. You can also buy gallons of 5% vinegar at a grocery store and add 2 teaspoons of dish soap to help spread and stick it to the leaves and adding 2 cups of table salt to it will make it much more effective. Be sure to clean your sprayer thoroughly after use as the acid can damage the sprayer. New Arrivals: The spring onion and garlic bulbs finally arrived today. Asparagus is on its way. I was expecting our second order of plugs today but they did not come. We moved a bunch of petunias and calibrachoas we are growing from plugs to the outdoors as we need the room in the greenhouse for veggie starts and the new plugs. Petunias and Calis can take some frost so they should be okay outside. These are taking longer to root out this year due to the cold night time temps and the scarce sunny days. Speaking of petunias, we have mixed 6 packs in for sale but no color on them yet. 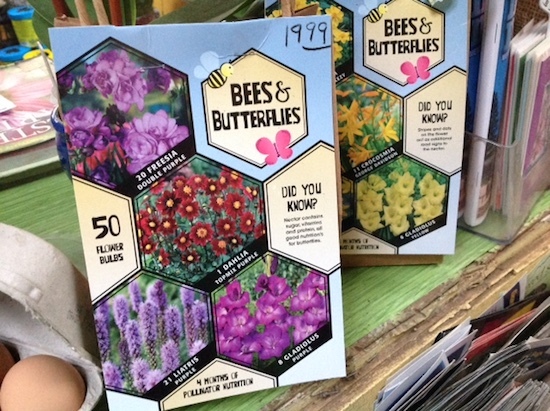 The Elephant Ear bulbs are here along with the cutest bagged assortment of bee and butterfly food bulbs. These look like they will make great gifts as will the Scatter Garden Pollinator blend seed cans from Renee’s Garden. I have been reading some articles about dire insect die off. Not just the Monarchs and Bees are disappearing. This has a potential for a lot more things like songbirds not having enough to eat, so let’s do our part and plant habitat and food for these fragile creatures. There is barely enough space already at the nursery with our tables and racks filling up with new stuff. 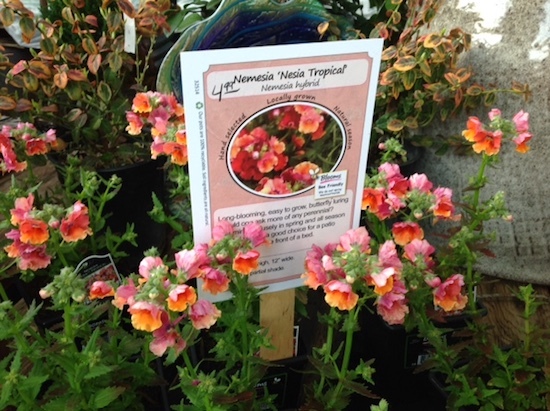 Fresh plants include Agastache, Guara, Salvias including Hot Lips and Blue Note, Red Valerian, Catmints, Penstemons, Geraniums, Coreopsis, Blanket Flower and Lavenders. Most of these are pollinator attracting so you will be doing your yard and the world a service by planting them. Some of the best things you can plant are natives for pollinators. We try to keep a good assortment available here. The Wild Lilac should be one of the next things to bloom along with Redbud. Look for them in the native section. Have you seen the colorful pottery from Spain? Our pottery selection is well stocked with some different selection this year. Mark Your Calendars: April 27th is our Annual Sharp Event. Ron Barber will be here to sharpen mower blades, hand tools and shovels from 10-1. If that won’t work for you, there is the option of dropping your tools off ahead of time and pick them up later on Sat or Sunday. Master Gardener Louise will give a presentation at 1:00 on fire-wise gardening and the Master Gardener Help Desk will be here from 10-2 also. They have a lot of free information pamphlets for you to pick up that are very helpful. Remember you can always call them in Lakeport with issues and they can research it and get back to you. We will have some day-only specials and refreshments that day. 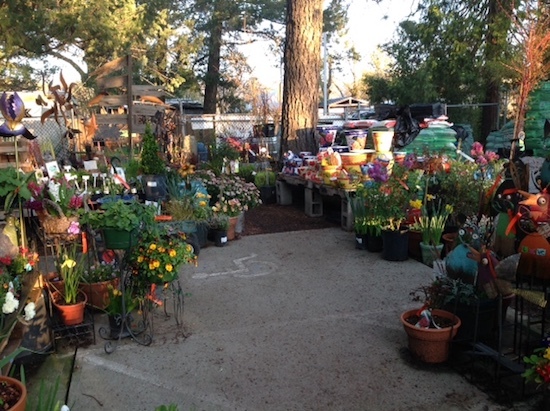 It is also Earth Day at Calpine so no excuses not to head into town for the day. We have potted up all the roses and have made a good start on the trees. We still have some fruit and shade trees available bare root (usually a better deal for the pocketbook), but these will not last much longer before we will have to pot them up. I am going to put them on sale while supply lasts so you can save us the time and labor of potting. We will take a little more time to plant the liner pots of berries, figs, goji, olives, and pomegranate but once we do the price goes up. Spring flowering Cistus varieties, otherwise known as Rockrose, are a climate appropriate shrub for our area. Not only are they on the deer resistant and fire wise lists, but they also take our heat, are fast growers and are drought resistant once established. They bloom white or in pinks, depending on the variety. The blossoms have a crepe paper-like look, and the larger flowers are almost poppy like in appearance. Some will stay low to the ground and make a good ground cover for erosion control like Cistus ‘Sunset’ while other varieties can get over 6 ft tall and wide. They like good drainage if they are to be irrigated but will grow in poor soil and wind. They do not take well to hard pruning so best to lightly shape if necessary although I find that is usually not needed. 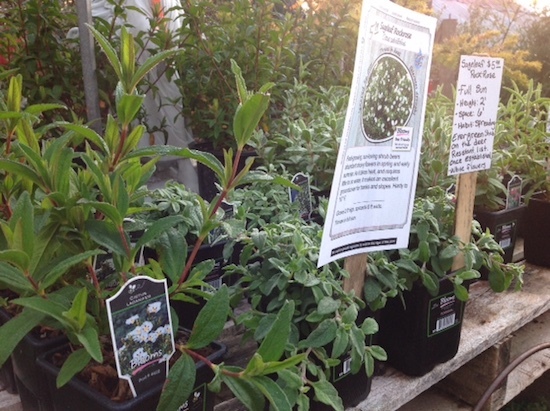 We have a nice selection in at the moment of 4” and #1 pots of several varieties. Cistus ‘Sunset’ with small dark pink flowers to 2ft tall and 6ft wide. Cistus salvifolius with white flowers to 2ft tall and 6ft wide. Also called Sageleaf Rockrose. Cistus x skanbergii with grey-green leaves and profuse light pink flowers to 3ft tall and 8ft wide. Cistus hybridus also called White Rockrose with, you guessed it, white flowers to 3ft by 3ft. Cistus ladanifer, Crimson Spot Rockrose, with white flowers and a red center up to 5ft tall and wide. 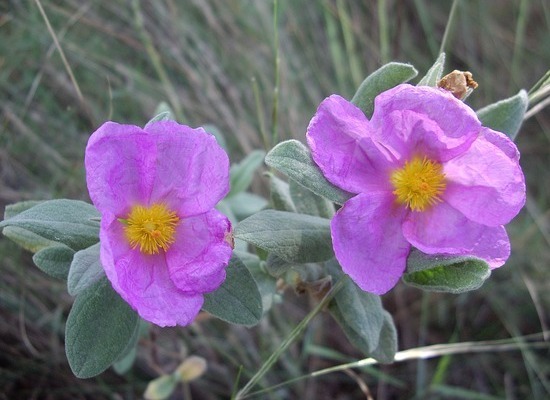 Cistus x purpureus, the Orchid Rockrose to 4 ft tall and I have seen it 6 ft wide with large purple-pink blooms.